New York City, USA – Alumna of the American University of Armenia (AUA) School of Public Health (AUA SPH) Lusine Poghosyan, PhD, MPH, RN, is one of just 12 nursing faculty members from across the United States to win a highly competitive grant from the Robert Wood Johnson Foundation. She has been selected as the 2013 Robert Wood Johnson Foundation Nurse Faculty Scholar, a prestigious program that advances the careers of talented junior nurse faculty. Dr. Poghosyan is an Assistant Professor at the Columbia University School of Nursing. She completed her doctoral and post-doctoral training at the University of Pennsylvania School of Nursing and her Master of Public Health at the AUA School of Public Health. She was a fellow at the Center for Health Outcomes and Policy Research at the University of Pennsylvania School of Nursing, where she conducted research exploring international issues related to the nursing workforce and quality of care. Dr. Poghosyan is a Principal Investigator on multiple federal and foundation funded grants, including those funded by the Agency for Healthcare Research and Quality, the American Nurses Foundation, and the Robert Wood Johnson Foundation. Her current research investigates the primary care Nurse Practitioner (NP) workforce and policies. Dr. Poghosyan developed the first NP-specific survey instrument, the NP Primary Care Organizational Climate Questionnaire (NP-PCOCQ), to measure primary care NP practice environments. 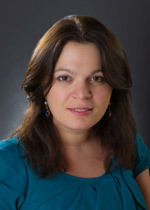 Dr. Poghosyan is a recipient of multiple awards, including the 2009 Research Scholar Award from Sigma Theta Tau International (Gamma Epsilon Chapter), the 2010 American Nurses Foundation Scholar award, the 2012 New Investigator Award from the AcademyHealth Interdisciplinary Research Group on Nursing Issues (IRGNI), and the 2013 Robert Wood Johnson Foundation Nurse Faculty Scholar award. Dr. Poghosyan is a board member of the Advisory Board for the AcademyHealth Interdisciplinary Research Group on Nursing Issues (IRGNI). She has presented in national and international venues. She was an invited speaker on the 2012 AcademyHealth panel, entitled “Preparing the Primary and Specialty Care Workforce for the Medical Home,” and in 2013 she chaired the Evolving Primary Care and Workforce Models session at the same meeting. Her work has been published in multiple nursing and interdisciplinary journals, including Nursing Research, Policy, Politics & Nursing Practice, Health Care Management and Review, and Health Informatics.